The HubSpot calling tool lets you reach your best prospects in just a few clicks. You can connect right from your browser or phone and record the call if you choose. At the end of your call, everything is automatically logged to your HubSpot CRM or Salesforce. Before you can start making calls, you'll need to add your phone number to HubSpot and verify it for calling. The phone number registration process for calling with HubSpot is user-specific. While two or more users can use the same number in your account, each user must register the phone number individually. Before you register a phone number, make sure your country is supported for calling. On the contact record, click the Call tab. Click Start calling to register your phone number. In the dialog box, enter your phone number and an extension (if applicable). Then, click Register. 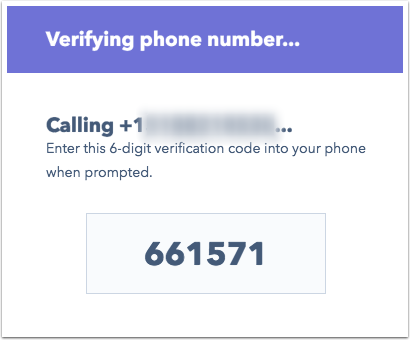 Next, you'll receive a phone call to verify that you have access to the phone number added. When prompted, enter the verification code that appears on your screen. Once this is completed, a confirmation message will appear. 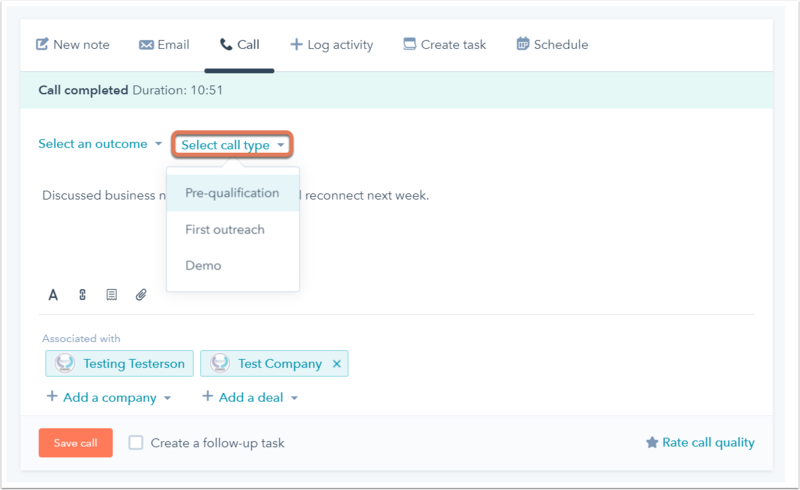 You can now make calls with HubSpot's calling tool. Please note: the country code must be included when dialing to or from a country supported by calling outside of the United States. The format may include a "+" or not. HubSpot will also dial the number set for the contact's Phone number property. If your contact does not have a value for Phone number, add a phone number. You can place a call through your browser or by using a physical phone, like a desk phone or cell phone. Click Call from phone. If Call from browser is selected, click the dropdown menu and select Call from phone. You'll receive a phone call from an automated system, which will connect you with your contact. The recipient's caller ID will display whichever phone number is selected in the Calling from dropdown menu. Please note: when using the Call from phone option, two calls are made: one to the first phone to set up the recording, and another to the second phone for the actual call. This will double the amount of calling minutes used. Click Call from browser. If Call from phone is selected, click the dropdown menu and select Call from browser. The recipient's caller ID will display whichever phone number you have set as the default for calling. If you need to enter an extension after beginning your call, click the Keypad icon. Tap the name of a contact. On the contact record, tap the phone icon calling. In the Allow HubSpot to record audio? prompt that appears, tap Allow. If you need to enter an extension after the call is connected, press Keypad. 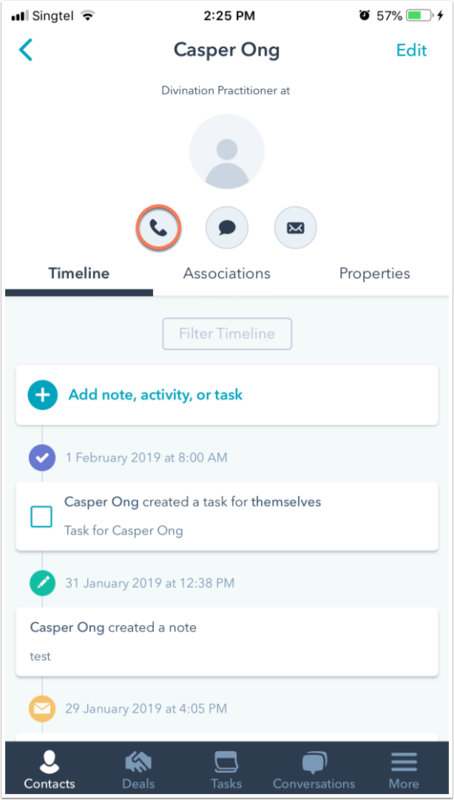 Please note: calls in the HubSpot mobile app are made using HubSpot's calling tool by default, which use the calling minutes associated with your HubSpot account. To use calling minutes associated with your mobile phone plan, tap More in the bottom right and tap Settings. Tap Call Client, then select Cell Provider. 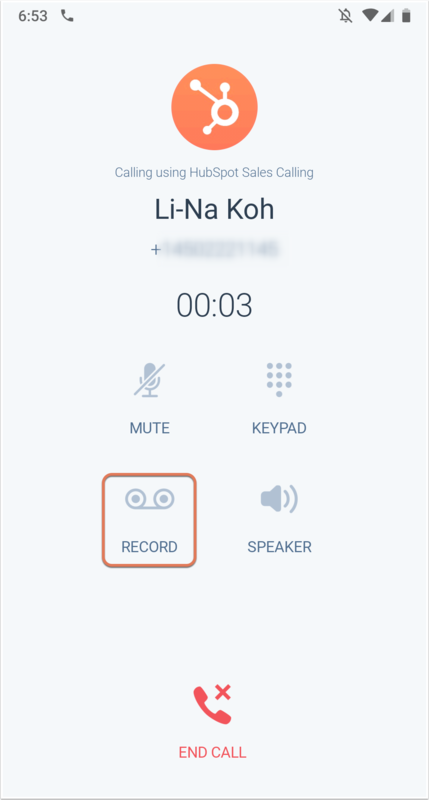 Once the call is connected, in the upper right, click Record to record the call. You can also type notes during the call. In the mobile app, tap Record. Call recording will be automatically enabled for one-party consent states. For all other areas, you'll need to get consent from the party you are calling in order to enable recording. In this case, you'll receive an alert after clicking Record. Make sure you inform the contact that you're recording the call, then click I have informed them. 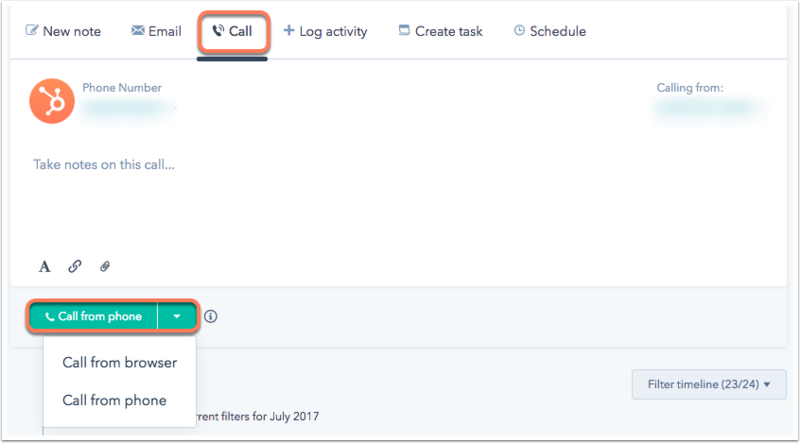 When the call ends, you can add any additional notes and click the Select an outcome dropdown to select the call outcome. 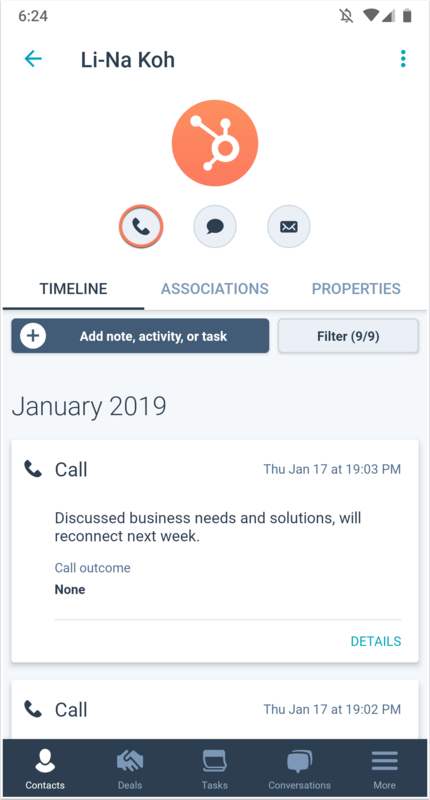 If customized call and meeting types are enabled, you can click the Select call type dropdown menu to select the call type. Click Save call to save the call on the contact timeline. In the mobile app, enter a note to associate with the call, then tap Save. Please note: if you stop recording during a call, none of the call recording will be saved. Learn more about why your call recording may not save. After you save the call and its recording, they will appear on the contact timeline for you to revisit and listen to. To edit or delete the call, click Edit to make changes. To remove the call from the contact timeline, click the Actions dropdown menu and select Delete. If you are a Sales Hub Enterprise or a Service Hub Enterprise user, you can access the call's transcript on the contact's timeline after the call has been saved. The call needs to be recorded in order for it to be transcribed. The transcript will appear on the contact's timeline as an attachment. Click Call transcript to open the transcription. 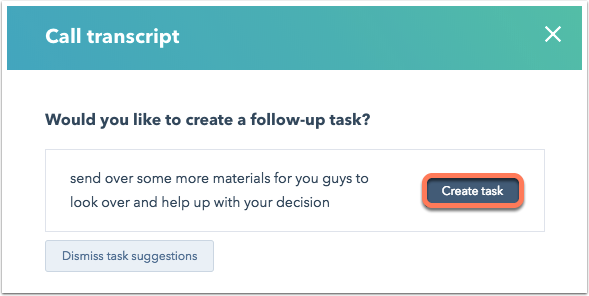 In the Call transcript panel, click Create task to create a follow-up task based on what was discussed during the call. Enter any additional task details in the Create task panel, then click Create. In order for the option to create a task to appear, one of the following words must be used during the call: send, provide, deliver, share, schedule, arrange, organize, plan, add, set up, reach out, call, meet, contact, confirm, validate, approve, accept, authorize, sign, check, get back to you. These words must be used in combination with let me, I will, or why don't I to create a follow-up task suggestion. Please note: it can take up to as long as the duration of the call for a transcript to appear, so longer calls might take more time to transcribe. Calls are transcribed using a service from Google and are currently only available in English. HubSpot will automatically label each transcript Good, Fair, or Poor depending on the quality of the transcription. The quality is determined by how many words in the transcript are likely to be correct. Click the Calling from dropdown menu and select Add new phone number. In the left sidebar menu, navigate to Sales > Calling. In the Phone Numbers section, click the star next to the phone number to set as the default. In the Phone Numbers section, click Delete next to the number. Once deleted, the number will no longer be an option for calling. If you enabled calling a month ago, and have not registered any new numbers or made any calls in the past seven days, the calling tool will be disabled in your account. You'll be notified in your notification center, and will have seven days from when you were first notified to place a call or re-register a number. HubSpot's calling API now allows users to integrate their own calling functionality directly within HubSpot. 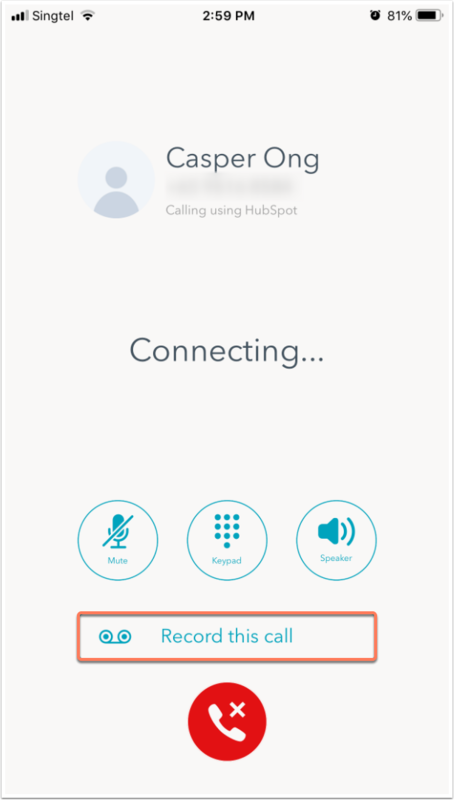 Currently, HubSpot's calling API allows users to integrate with Aircall. You need to be a Sales Hub Enterprise user or a Service Hub Enterprise user and have a valid Aircall account in order to use this feature. This feature is currently in beta. Please note: this feature works with the existing Aircall integration, though it replaces the need to call from the Aircall desktop app. 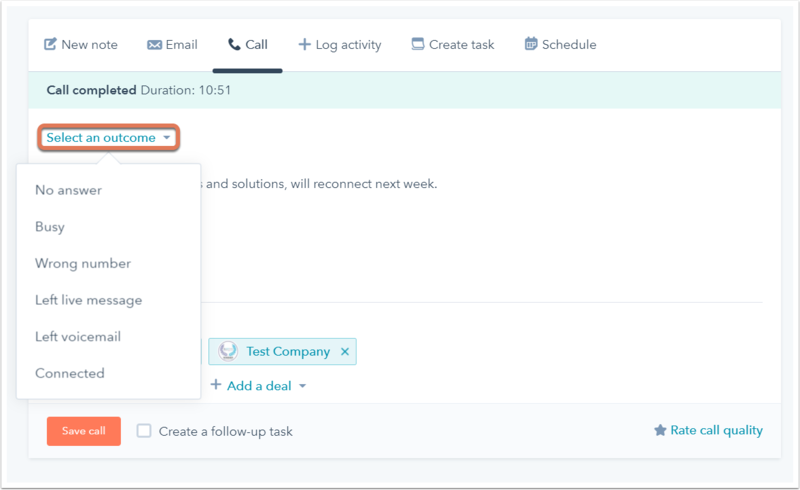 Non-enterprise users can still use the Aircall integration with HubSpot, but calls must be placed from the Aircall desktop app. If you choose to integrate your own calling functionality, you will no longer be using minutes from your HubSpot account. 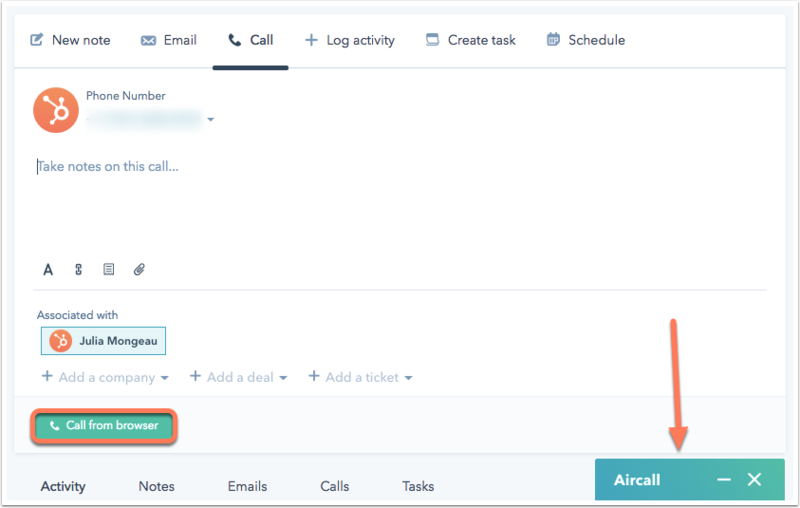 Once your Aircall account is integrated with HubSpot, all paid users will default to using provider-agnostic calling. 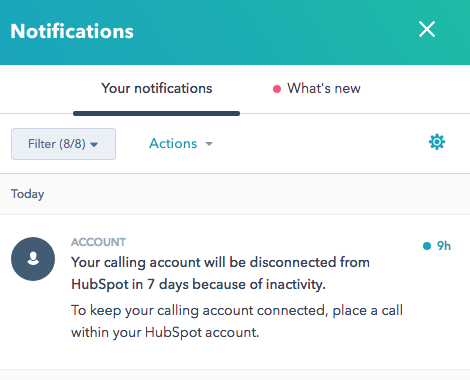 The connection with HubSpot’s native call service provider will be unavailable as long as you are using the Aircall integration. However, if there are any free users in your account, they will still rely on HubSpot's native call service to place calls from HubSpot. In the Aircall app window, click the green phone calling button to start your call. Enter notes in the Add a comment field. Enter an extension in the keypad. To end the call, click the red phone icon calling. To save the call to the contact's timeline, click Save & Quit. Please note: call transcripts are currently not available for calls made using Aircall.